Categories also allow you to split the implementation of a class across several files (a feature more naturally supported in C++). 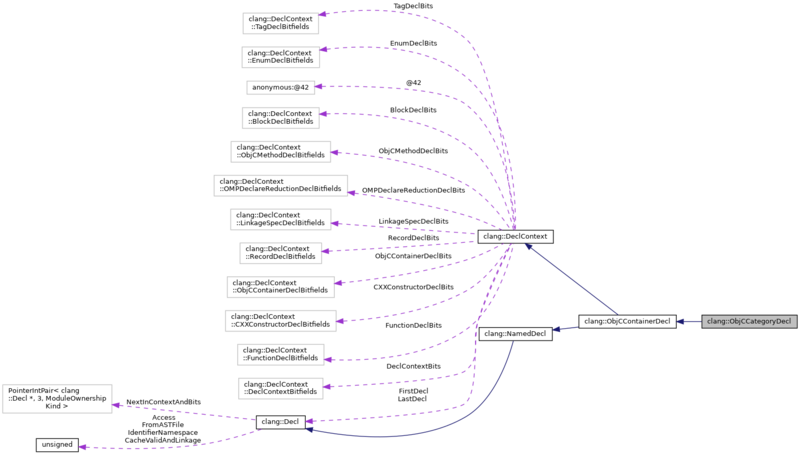 Categories were originally inspired by dynamic languages such as Common Lisp and Smalltalk. More traditional class-based languages (C++, Java) don't support this level of dynamism, which is both powerful and dangerous. Definition at line 2279 of file DeclObjC.h. Definition at line 2391 of file DeclObjC.h. Definition at line 2392 of file DeclObjC.h. Definition at line 2352 of file DeclObjC.h. Definition at line 2366 of file DeclObjC.h. Definition at line 2367 of file DeclObjC.h. Definition at line 2353 of file DeclObjC.h. Definition at line 2420 of file DeclObjC.h. Definition at line 2421 of file DeclObjC.h. Definition at line 1986 of file DeclObjC.cpp. References clang::C, clang::ASTContext::getASTMutationListener(), clang::ObjCInterfaceDecl::getCategoryListRaw(), clang::ObjCInterfaceDecl::hasDefinition(), and clang::ObjCInterfaceDecl::setCategoryListRaw(). Referenced by clang::Sema::ActOnStartCategoryImplementation(), and clang::Sema::ActOnStartCategoryInterface(). 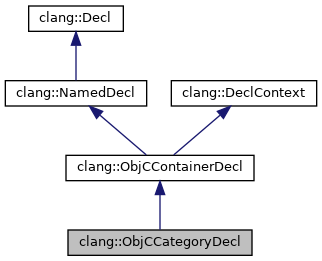 Definition at line 2012 of file DeclObjC.cpp. Definition at line 2412 of file DeclObjC.h. Definition at line 2324 of file DeclObjC.h. Referenced by clang::Sema::CheckCategoryVsClassMethodMatches(), clang::ASTDeclWriter::VisitObjCCategoryDecl(), clang::TextNodeDumper::VisitObjCCategoryDecl(), and clang::ASTNodeImporter::VisitObjCCategoryImplDecl(). Definition at line 2325 of file DeclObjC.h. Definition at line 2019 of file DeclObjC.cpp. Referenced by clang::Sema::ActOnStartCategoryImplementation(), clang::TextNodeDumper::VisitObjCCategoryDecl(), and clang::ASTNodeImporter::VisitObjCCategoryImplDecl(). Definition at line 2416 of file DeclObjC.h. Definition at line 2418 of file DeclObjC.h. Referenced by RewriteOneForwardClassDecl(), and clang::ASTDeclWriter::VisitObjCCategoryDecl(). Definition at line 2381 of file DeclObjC.h. Retrieve the pointer to the next stored category (or extension), which may be hidden. Definition at line 2385 of file DeclObjC.h. Definition at line 2348 of file DeclObjC.h. Retrieve the type parameter list associated with this category or extension. Definition at line 2329 of file DeclObjC.h. Referenced by clang::ASTNodeTraverser< Derived, NodeDelegateType >::VisitObjCCategoryDecl(). Definition at line 2389 of file DeclObjC.h. Referenced by clang::Sema::ActOnStartCategoryInterface(), and clang::ASTDeclReader::VisitObjCCategoryDecl(). Definition at line 2396 of file DeclObjC.h. Definition at line 2408 of file DeclObjC.h. Definition at line 2400 of file DeclObjC.h. Definition at line 2404 of file DeclObjC.h. Definition at line 2394 of file DeclObjC.h. Definition at line 2359 of file DeclObjC.h. Definition at line 2363 of file DeclObjC.h. Definition at line 2373 of file DeclObjC.h. Definition at line 2377 of file DeclObjC.h. Definition at line 2369 of file DeclObjC.h. Definition at line 2364 of file DeclObjC.h. Definition at line 2355 of file DeclObjC.h. Referenced by hasObjCExceptionAttribute(), clang::ASTDeclWriter::VisitObjCCategoryDecl(), and clang::TextNodeDumper::VisitObjCCategoryDecl(). Definition at line 2413 of file DeclObjC.h. Definition at line 2024 of file DeclObjC.cpp. Referenced by clang::Sema::ActOnStartCategoryImplementation(), and clang::ASTNodeImporter::VisitObjCCategoryImplDecl(). Definition at line 2415 of file DeclObjC.h. Definition at line 2417 of file DeclObjC.h. Definition at line 2343 of file DeclObjC.h. Set the type parameters of this category. This function is used by the AST importer, which must import the type parameters after creating their DeclContext to avoid loops. Definition at line 2028 of file DeclObjC.cpp. Definition at line 2310 of file DeclObjC.h. Definition at line 2311 of file DeclObjC.h.